On June 28, Kris Kobach — the vice chair of Trump’s “voter fraud” Commission — sent letters to chief state election officials requesting they submit “publicly-available data from state voter rolls and feedback on how to improve election integrity” by July 14. The Brennan Center filed lawsuits in Indiana, Texas, and Utah to prevent officials from submitting data in a manner that did not comply with state law. The ACLU of New Hampshire, Common Cause, the Electronic Privacy Information Center (EPIC), the Idaho State Democratic Party, and Public Citizen also filed lawsuits in state and federal court to block the Commission's request. Former national security officials writing in The Washington Post and The Hill have warned that a central repository of voter data would be a target for hackers. Privacy concerns prompted thousands of voters in Colorado to cancel their registrations, and election officials in Arizona, Michigan, North Carolina, and Vermont also reported cancellations. 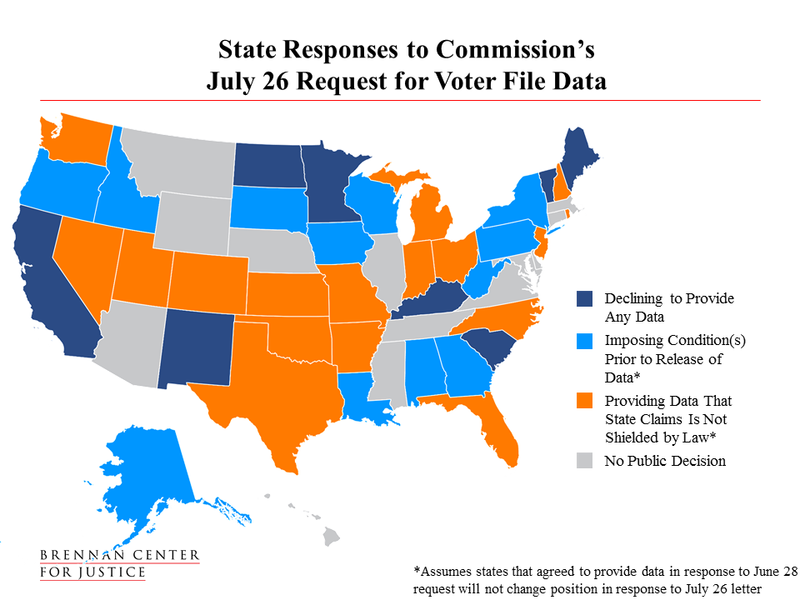 Following the court’s denial to halt the request, Kobach issued a new letter on July 26 again asking states to submit voter data — ​but, emblematic of the Commission’s general lack of transparency, Kobach’s fellow panel members were left out of this decision-making process. Maine Secretary of State Matthew Dunlap, who serves on the Commission, said they never discussed renewing the request. So far, eight states have declined to provide any data in response to the July 26 request.